Governance, on every scale, is not set up to create great places. Indeed, the current culture and structure of government and civic infrastructure may actually be the greatest obstacle (more than money, ideas, talent, infrastructure, etc.) to successful Placemaking. As ingrained as government and its relationship to communities might seem, we are finding that these obstacles are ones that all parties are poised to overcome. Governance, whether formal or informal, strong or weak, top-down or bottom up, has great potential to redefine and refocus itself around Place. Inherently bound by place, and tied to the success of the places it governs, government is still largely missing a coherent focus on enhancing its places. The siloes of government not only ignore place, but often degrade its potential value. Currently, no department or community organization is in charge of creating good places. Even when everyone is doing their job masterfully, great places generally fall outside of everyone’s mission and goals. In fact, in siloed departments the desired outcomes of mobility, economic development, safety, cultural development, tourism, etc. are inevitably in conflict and competition, frequently undermining the public realm that determines their ultimate success. Yet, each faction of government is responsible for important elements of Placemaking, and would often best accomplish its independent departmental goals through a proactive focus on place outcomes. Rather than just sustaining and delivering public goods, government can evolve from regulating "the tragedy of the commons" to fostering its triumph. In other words, government can be most efficient at delivering value when structured primarily to facilitate the capacity of a community to drive and sustain its own shared value. When a government organizes itself around creating successful public spaces and generating Place Capital, it is often able to accomplish a broad range of existing goals more efficiently. When performing at their best, communities organize to compete to contribute to the public realm and shared value. Indeed, the most loved places were invariably created through this often informally generated culture of governance. Through our work on public spaces around the world, we are discovering that a focus on Placemaking is not only a logical one for most governmental agencies and community-focused organizations, but one that is often a rather natural transition. 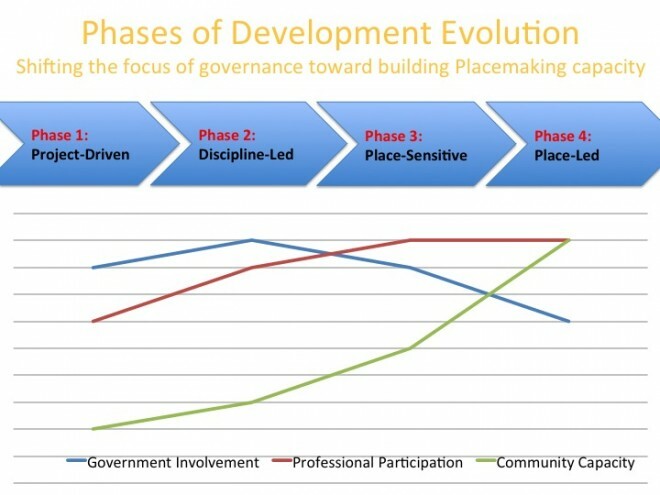 Independent public space management organizations often represent the current leading edge of Place Governance, still working with minimal coordination with government. 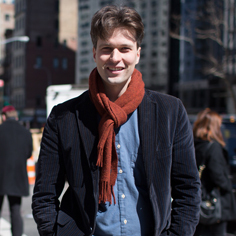 Whether formal or informal, it is only when public spaces are managed that they can work. PPS continually finds that management (including maintenance, programming, outreach, etc) accounts for 80-90% of the success of a space, and that spaces need to be designed in a way that supports management—not the other way around. Through the Placemaking process, governments can set places up to self-manage, and sometimes even to self-govern, by creating a culture of engagement in the community that supports a given space. Since its founding, PPS has worked to transform how we manage our downtowns and public spaces, developing many of the first models of, and research on, downtown management. PPS helped found the Main Street model back in 1980 and wrote one of the first books on downtown management: Managing Downtown Public Spaces. Through the years we have been working around the world with many of the most innovative Business Improvement Districts and downtown organizations to help them continue to evolve from a focus on maintenance, security, and marketing to leading programming, community-building and Placemaking. Increasingly, that work is looking to evolve these local governance models towards transformative leadership in their government and community contexts. In Adelaide, Australia, PPS has been working to train staff and civic leaders in Placemaking and support strategic planning for the city to move towards a place-led governance model. They have seeded this transformation through an aggressive Lighter, Quicker, Cheaper program called Splash Adelaide, which is having a very visible impact on the public realm and peoples’ perception of how it can be shaped. They are now piloting “Place Capital” metrics and “place audits” to track success and support. The long-term goal is to shift place governance capacity to the district level. The Splash Adelaide program was directly inspired by the New York City Public Plaza Program which, as well as being an example of highly visible transformation of space to support social activity, was a model centered on partnering with local community-based management capacity to plan, maintain and program the city’s new plaza spaces. Many of these first spaces indeed grew out of community-initiated Placemaking and self-governance in partnership with our NYC Streets Renaissance Campaign, intended to demonstrate and foster this process. The program's continued sustainability and relevance to lower-income neighborhoods, is dependent on Place Governance capacity building throughout the city. The concept of low-cost improvements that can be made in a matter of weeks or months changes the way that cities approach community development. It requires removing bureaucratic obstacles to quickly add value to a place and clearly demonstrate future potential. Working together on short-term changes can help build bridges between city agencies, as well as to, and between, citizens, benefiting long-term implementation and maintenance as well. Even when the expertise and networks for successful public space exist, we find that groups have rarely focused collectively on improving public space, but when asked to do so, are able (with basic tools, education, and facilitation) to quickly vision and implement very effectively. In light of this impact in our Placemaking projects, we have increasingly focused beyond leading projects to providing the tools, resources, capacity-building and strategic planning for stronger Placemaking and Place Governance. At a city level, we have focused on shifting the culture and capacity of governance through various approaches to Placemaking campaigns and academies in cities like Detroit, Los Angeles, San Francisco, Chicago, San Antonio, Indianapolis, Baltimore, Seattle, Omaha, Flint, MI, Brunswick, ME, Bellingham, WA in the US; Vancouver, Regina and Mississauga in Canada; Newcastle, Perth, Adelaide and Melbourne in Australia; Stockholm, Sweden; Singapore; and Pimpri-Chinchwad, India. In Michigan, the campaign to focus governance through Placemaking that began in many towns and cities has caught on like wildfire, and has grown to be a state-wide effort. At a national level, we’ve also had ongoing programs to support the introduction of Placemaking and Place-led capacity building through programs with several federal agencies including: a partnership with the Good Neighbor Program of the General Services Administration to improve federal public spaces, running the Context Sensitive Solutions online resource center for the Federal Highway-Administration, leading a “Livability Solutions” Smart Growth technical assistance program for the Environmental Protection Agency, and now coordinating the National Endowment for the Arts’ Citizens’ Institute on Rural Design. We also run programs with many private and philanthropic partners, including our Heart of the Community program with Southwest Airlines is building the capacity for placemaking and place governance in the cities they fly to. Internationally, we are looking to influence the governance of developing cities and nations though our partnership with UN Habitat. We are doing this through trainings and projects and a joint conference series, called the Future of Places, that will culminate in a written document to encourage the adoption of Placemaking principles at the Habitat III UN global gathering in 2016. 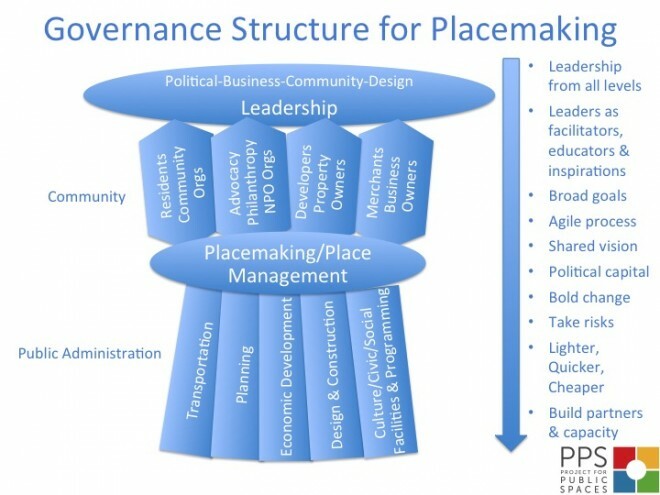 As we have experienced in all of these contexts, Placemaking identifies and draws out local leadership, partners and resources on all levels of community and government. When we ask: “What if a central focus of governance became the building of successful places?” there is general comfort and energy to make that happen–to work together in new ways. The fractured, siloed structure of contemporary government, with its myriad departments and bureaucratic processes, often directly impedes the creation of successful public spaces. Transportation departments view their mission as moving traffic; parks departments are there to create and manage open green space; community development agencies are focused on development of projects, not the spaces in between them or the organic opportunities that arise from social interactions within them. 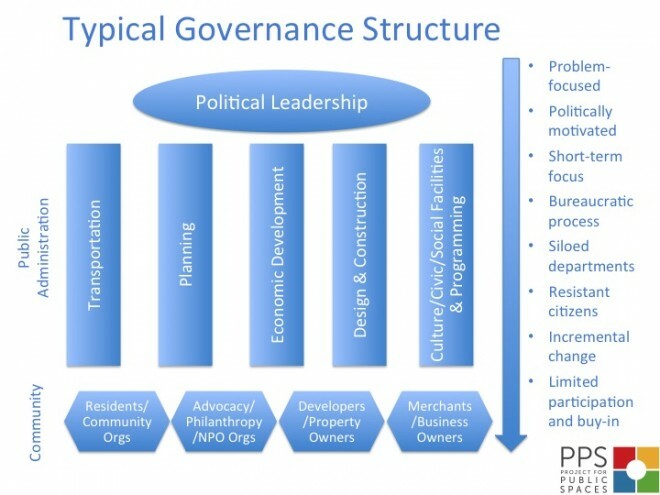 The current siloed structure of governance perpetuates a top-down process and culture. The Placemaking approach builds on the ability of place-based institutions to create great community places that bring people together and reflect community values and needs. In cities where Placemaking has taken hold, local government is often not directly involved in implementation, but relies on more localized community development organizations, business improvement districts, and/or neighborhood partnerships to take the lead in making community change happen. How would moving toward a place-centered governance shift the effectiveness of government’s ability to work across departments and with the communities it is meant to serve? Organizing governance around Place outcomes shifts power and responsibility to communities, while supporting a culture of leadership. If the ultimate goal of governance, public institutions, and development is to make places thrive, then governance culture and processes need to change to reflect that goal. Place certainly does not represent all of the public good and value in a community, but place as an organizing focus can best help that value be preserved, shared and leveraged. A focus on place supports a culture of leadership to emerge from all levels, inside and outside of government. 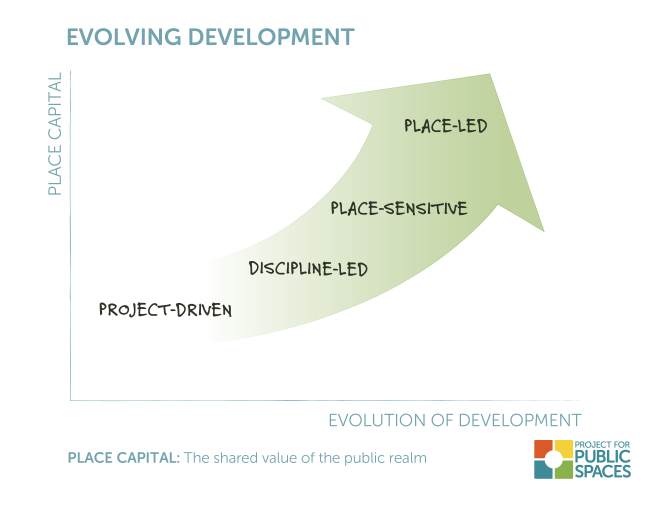 A Placemaking culture challenges everyone to compete to contribute to shared value. Bad ideas and privatizing forces are adeptly kept in check or pushed out. The open governance process and culture, enabled by a shared focus on place, is more accessible to all, and more compatible with constructive participation. Shifting power and responsibility for governance to communities allows for more efficient and dynamic models to emerge. More networked community relationships diversify skills and resources and support more adaptability. People in power, and professionals, no longer have to have the solutions and focus on selling them, but can instead gain power to lead change by acting as facilitators, resources and inspirations to change. No more are places and Placemaking something that government solely delivers for communities. When government is project-led, or discipline-led, change is imposed, managed and mitigated. 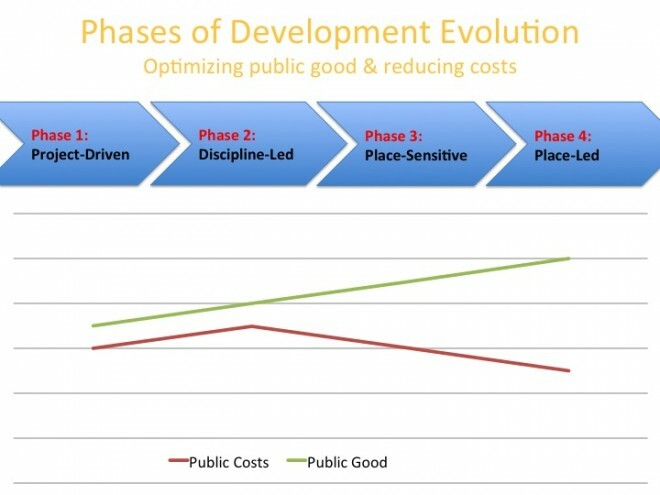 When civic infrastructure supports locally-directed change, improvement is less defined by ongoing costly services and projects. Desired change does not need to be as expensive to achieve locally defined goals and can draw on funding from a broader range of sources. Space can more easily evolve and adapt and bounce back based on the enhanced network of participants in its management. The public realm delivered through a more place-led governance is one that is inherently more open, authentic and culturally vibrant. The most self-managed spaces invite and challenge existing and new participants to raise their behavior to contribute to the shared experience. Existing members have less fear of the negative impacts of gentrification as new people and investment are attracted only towards supporting the existing communities vision of itself. And emerging places are not defined by their design or infrastructure, given to and consumed by citizens, but by their locally-defined uses and values. What if government’s focus was not just to deliver better places to live, but to build capacity for communities to preserve and create their shared wealth in the public realm? The future of thriving and resilient cities is not led by sustaining or innovating around infrastructure and services, but by building the capacity of communities to drive their own shared value–to sustain Placemaking. Cities are not going to effectively compete with each other by just developing better physical infrastructure, but by creating great places, and Place Governance, that attract people to help them further develop. It is those cities developed by everyone, not those that are developed by government, that will most thrive in the future. Placemaking shouldn't be any one's job, it should be everyone's job.